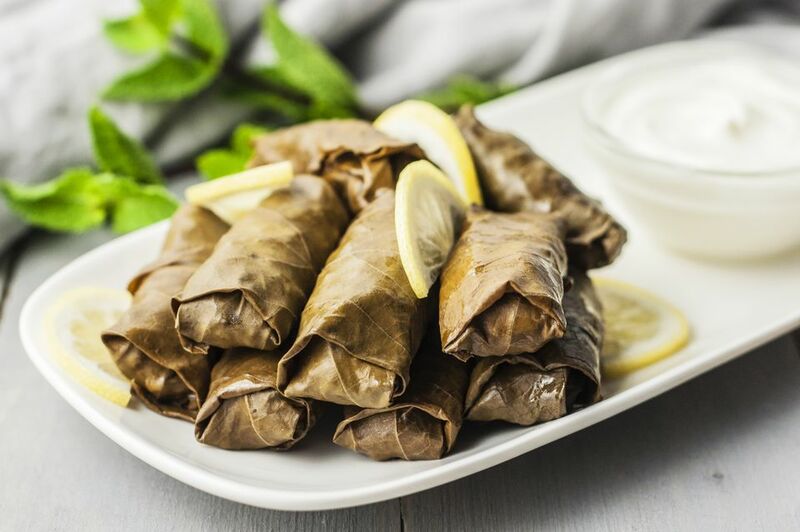 These bundles of meat and rice wrapped in rolled grape leaves are a favorite dish in Greece. Dolmathakia me kima, or ντολμαδάκια με κιμά in Greek, is pronounced dohl-mah-THAHK-yah meh kee-MAH. The name comes from the Turkish word dolma, meaning "stuffed;" and aki means "little one," so a dolmathakia is literally a little-stuffed wrap. You will find them as part of a mezze platter, alongside a Greek salad, or served as a side dish. You can make this recipe with large grape leaves, which obviously results in a larger meat and rice package, making them ideal for a filling lunch or light dinner. Since they are time- and labor-intensive to make, this recipe is a pretty large quantity. You can store the stuffed grape leaves in the refrigerator for several days, or freeze them for later use. A traditional accompaniment for dolmathakia is avgolemono, a sauce made of eggs and lemon juice. Bring 8 cups of water to a boil in a large pot, and add the juice of 1/2 lemon and the salt. Carefully unroll the leaves (do not separate them). Turn off the heat and place the leaves in the hot water for 3 minutes. Remove the leaves and place them in a bowl and cover with cold water. When cooled, drain in a colander. It is not unusual for many of the outer leaves in the jar to be damaged or to tear while using. Set these aside to use later in the recipe. Sauté the onions in 1 tablespoon of olive oil until translucent, not browned. In a bowl, combine the onion, ground beef, rice, remaining olive oil, dill, mint, juice of 1 lemon, and pepper. Mix well by hand. To fill and roll the leaves, gently separate one leaf and place it shiny-side down on a work surface. Place a pinch (up to a teaspoon) of the filling on the leaf at the point where the stem joins the leaf. Fold up the bottom of the leaf over the filling, then each side inward in parallel folds, and roll up the leaf. The roll should be firm, not tight, as the filling will expand during cooking. Repeat until all the filling has been used. Because the leaves on the bottom can burn while the filling cooks, put a plate or wooden souvlaki skewers in the bottom of a heavy-bottomed pot (see tip below). The plate should fit snugly in the pot. If there are unused leaves or leaves that were torn and not used during the filling process, put them on the plate or on top of the skewers. Place the dolmathakia on top, packing them closely together (not squashed), seam side down, so they don't unroll during cooking. Layer them until all are in the pot (two to three layers are best, but no more than four layers). Place several unused leaves over the top. Take another plate and place it upside down on top of the dolmathakia, using something to weigh it down (a second plate works well). Add the 2 cups of water to the pot and cover. Bring the water to a gentle boil, add the remaining juice from the 1 1/2 lemons, reduce heat to low and simmer for approximately 50 to 70 minutes. Check to see if done—if the rice has cooked, they are done. If not, continue cooking for another 10 minutes and check again. Cooking time depends both on the type of pot used and the particular stovetop heating element. If preferred, you can use a pressure cooker. No plates are needed but do use the skewers in the bottom. Pack the dolmathakia into the pressure cooker, add the 2 cups of water, close and cook for 15 to 20 minutes at the first pressure mark. If you don't have skewers or a plate that fits the bottom of the pot, line the bottom of the pan with unused or torn leaves. Leftover filling can be used to make stuffed vegetables like tomatoes, peppers, zucchini, and eggplant. To make stuffed grape leaves as a main course, use larger grape leaves and increase the amount of filling in each leaf to 1 tablespoon. Individual servings of dolmathakia are four to five pieces on small plates as an appetizer; however, they can also be eaten as a side or main dish (especially when larger leaves are used). Serve dolmathakia warm or at room temperature with avgolemono (egg and lemon sauce), lemon wedges, tzatziki, or plain yogurt on the side. These will keep well in the refrigerator for about five days. Drizzle olive oil on top and cover to store. Return to room temperature before serving. They can also be frozen. If you do freeze them, reheat in the microwave or by steaming and serve warm. Don't just thaw and eat.